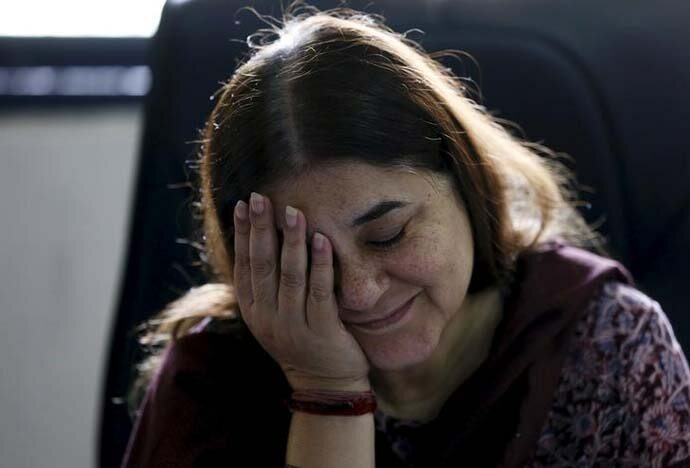 A few days after Union minister and BJP MP Maneka Gandhi was seen manoeuvring the Muslim voters of Sultanpur into voting for her, a secret 'grading system has surfaced. Apparently, this system is in place in Pilibhit as well — from where Maneka has been winning elections since 1999. No grading system will ever work in India. Neither will Indian parents stop asking which marks a grade stands for. Nor will Indian politicians stop spelling out the sinister designs they have in their minds, such as these are. One of the reasons our examination system switched to grades instead of marks was to do away with the unnecessary pressure that a difference of one or two marks creates. So much for grades then. The minister laid out her parameters very easily — but, you know, we don’t think it’s as easy as she said. It will need a war room of people with supreme mathematical acumen. Now, if we have so many smart people assisting Maneka’s election war room in Pilibhit, then who's running the IITs? Excuse me? BJP’s 'Sabka Saath, Sabka Vikas' is exactly what Maneka’s ABCD grading is not. Or, do they, by ‘sabka’, mean all those sabs who vote for BJP? This is a genuine question. What happens to those in the C category village who voted for you? Do you have a machinery penetrative enough to reach them, uproot them from grade C and then place them in grade A or B villages, so that they reap the benefits of the noble job they did? Where are the supplementary classes? 'A' will always remain 'A' and 'D' will always remain 'D' — this never happens; in life, examinations or democracy. So, if a C-grade student is barred from attending classes because, of course, he/she didn't pay attention and that's how he/she ended up with a C, then how will he/she progress and eventually one day become 'B' or 'C'? If the villages that didn't vote for Maneka get the rawest deal from her, does she really think the next time they would vote for her? The joke is on our political strategy (which was never there). Also Read: Brutal honesty: Maneka Gandhi says she won’t work for Muslims if they don’t give her votes. She just broke the hypocrisy mould!